Today’s view of Richtofen Castle located at 12th and Pontiac. The exterior of the castle was considerably softened by red tile roofing, extensive landscaping, and the addition of Tudor-style wings on the south and west sides. Many of us catch glimpses of it from the street, but few have had the chance to enter its gates. Built in 1887 by Baron Walter von Richthofen, the uncle of the famous World War I flying ace, the Red Baron, the Richthofen Castle is a marvel. The castle was modeled on the Richthofen family estate in Prussia. This 1887 photo was taken by famous Western photographer, William Henery Jackson. appropriately enough, from Castle Rock. The 14,600-square-foot castle includes 35 rooms on an acre of city land in Montclair, and it has a storied history. Baron Walter von Richthofen came to Denver from Prussia in the 1870s, seeking fortune in the American West. He purchased 320 acres of land east of Denver, with plans for a personal residence, an upscale health and recreational resort, and a suburban neighborhood. The original name of the castle was “Louisburgh” in honor of the Baron’s second wife, Louise.1 Louise moved into the castle in 1888, after the Baron had transformed the surrounding native prairie into landscaped gardens to please her. The couple only lived there for a few years, however, before embarking on global travels. about restoring the historic Richthofen Castle. After the Baron’s death in 1898, the castle eventually passed to a local manufacturing magnate named Edwin B. Hendrie, who significantly redesigned the castle. Hendrie’s architect, Maurice Biscoe, added a west wing and softened the Prussian façade with Tudor elements, also installing red tile roofing over the crenellated parapets and towers.1 In 1924, a south wing was added by Hendrie, designed by Jules Jacques Benois Benedict. The mid-20th century owners, the Perenyis, changed the property significantly when they sold off most of the grounds and the gate house that had been a part of it. The property became a national historic landmark during the tenure of the Seidens in the 1970s, ensuring that the façade will remain unchanged through future generations. The Jespersons purchased many period furnishings in the home from the castle’s previous owners, the Priddys, who had an antique auction business. This dining room table was once the Baron’s, and the chandelier is one of few remaining original light fixtures. 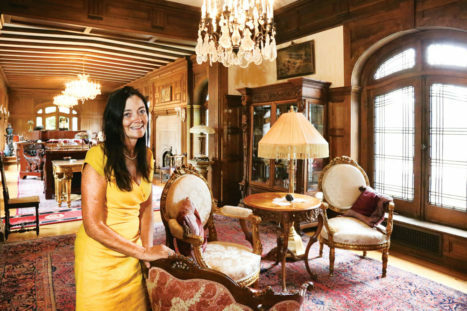 From 1984 to 2012, the Priddys, a family in the antique auction business, owned the castle and restored some of the Baron’s original furniture to the property, as well as adding other furnishings appropriate to the period. They also installed a WWI-themed “Red Baron” bar in the basement, which still exists today. The current owners, Robert Jesperson and Sylvia Atencio-Jesperson, purchased the castle in 2012 and reannexed the gatehouse around the same time. Richthofen greatly influenced the development of Montclair. He had envisioned establishing a health resort, and the “Molkerie,” which is now the Montclair Civic Building, was part of that effort. The leaded windows let plenty of light into the Library. Rumor has it that an underground tunnel once connected the castle to the Molkerie. Former resident Kurt Seiden recalls that the entrance was past the furnace room in the basement and that it extended at least to the end of the castle grounds, but says it has long been walled off. Another of Richthofen’s goals was to establish the neighborhood of Montclair. Richthofen and his business partner, Matthias P. Cochrane, planned to create an upscale suburban neighborhood. His original purchase spanned from Colfax far south, perhaps to Hampden, said Kurt Seiden, but the neighborhood as we know it now runs from Colfax south to 6th Ave. and from Holly east to Quebec. Homeowners who purchased plots in the Montclair development were required to build homes three stories high on lots that were twice the usual size of Denver city lots.1 Many of these large stately homes, visible in Montclair today, were built before further subdivision occurred. Sometime after Montclair was annexed to Denver around 1902, these restrictions changed, leading to the mix of sizes and styles of homes found in the historic neighborhood today. In addition to its architectural and historical significance, Richthofen Castle has been home to many families over the years. A high level of craftsmanship is evident throughout the property, as in this wood-paneled staircase that features hand-tooled wallpaper. Halloweens were particularly memorable, especially for the unsuspecting trick-or-treaters who came to the castle. Seiden and his friends would build a scarecrow-like body, he recounted. “We would go up into the attic, onto the roof, into the tower, hang it out the tower window and let it drop,” while screaming through the intercom, Seiden recalled. Atencio-Jesperson says her family loves to gather in the kitchen. She has used rhyolite that matches the castle’s exterior to frame out the hearth. The most recent owners, Robert Jesperson and Sylvia Atencio-Jesperson, began their journey at the castle in 2012. The longtime Colorado residents had experience with historic properties, having lovingly restored a home at 7th and Clarkson, so the opportunity to purchase such a unique property was appealing. “I really have liked the houses that we’ve restored, and I just wanted to do more of that,” said Atencio-Jesperson. When the Jespersons bought the property, there was extensive water damage throughout the house, so re-roofing, repairing the ceilings, and rebuilding many walls were necessary. They also dealt with other practical matters, like replacing the boiler and installing air conditioning. The grounds are their current project, reconstructing the historic fountain in a new location and installing landscaping that is “a little more formal, more elegant,” said Atencio-Jesperson, as befits the property. The formal parlor at Richthofen Castle holds the original nine-foot Kanabe grand piano. There are many fun parts to their restoration, too, especially the many discoveries they make in the process. After removing three false ceilings from what had been the master bathroom the Jespersons found a staircase remnant that leads to the tower, suggesting the Baron himself intended to use the iconic tower. They also enjoy hosting parties and events for organizations like The Denver Waldorf School. And now that the structural issues have been handled, Atencio-Jesperson says, “I would like to get into more of the decorative part. Get rid of the last remnants of the 1980s,” which were installed during a renovation by the Junior Guild of the Denver Symphony for a benefit event. The Jespersons continue the tradition of enjoying Halloween at the extraordinary property, but with their own twist. Every year, on the Saturday before Halloween, friends and family organize a themed party at the castle grounds for the community. Past events have included “Richthofen Asylum for the Criminally Insane” and “Richthofen Garden of Fantastical Creatures.” Though they would not reveal the theme for this year’s party, mark your calendars for it promises to be quite a bash. Noel, Thomas J. and Hansen, William J., Historic Denver, Inc.
Richthofen Castle owners: 1887-1891 – Richthofen; 1989 -1893 – Mueller (aka Miller); 1893-1903 – Richthofen; 1903-1937 – Hendrie; 1937-1946 – Thams; 1946-1947 – Hunt (but didn’t live there); 1947-1970 – Perenyi; 1970-1972 – Purcell; 1972-1980? – Seiden; 1980?-1984 – unknown; 1984-2012 – Priddy; 2012 – present – Jespersons. Seiden, O.J., Denver’s Richthofen Castle. Denver: Stonehenge Books, 1980. Lived in the neighborhood and daily passed the castle as a school child. We loved sneaking into grounds and eating the grapes just over the wall. Halloween was fun, too, as you walked up to the great door. On one end of the hill there was a great Dane that garded the yard and up the hill a black Scottie greated passer-bys. Big dogs inside the gates. That was some 58 years ago. I still think of the great place. I am looking for the floor plans for 930 N Washington St Denver for an art project. Would you know where I could find these floor plans”? Tom Noel and I wrote the Historic Denver Guide on Montclair. I have spent a good deal of time researching the Richthofens, as well as Prussian Aristocracy in Silesia generally during this period. (I did a lot of further research for Tom for the 100th anniversary of the Broadmoor, which was actually started by Prussian Count Pourtales at the same time as Richthofen, they knew each other, and were both from Silesia.) The Prussian aristocracy used Silesia as almost a mountainous playground resort and spa during this time. Situated on the Oder River, it had mountains, resorts and spas just to the west, vast mineral resources, and fertile agricultural lands to the east- a similarity to Denver and Colorado that can’t be easily overlooked. The Prussian aristocracy owned vast agricultural estates and worked them as somewhat elite gentleman farmers. This was during the period just after German’s unification and during the reign of Kaiser Wilhelm I, assisted by Otto von Bismarck, whose picture graced the entryway to the Richthofen Castle with a bust of Frederick Barbarossa, the first German unifier in the Twelfth Century, on an outside corner. The Prussian aristocracy was extremely conservative and nationalistic in Silesia at this time and, while heavily Protestant and supposedly tolerant of other religions per the dictates of Frederick the Great when he took over Silesia around 1742, were staving off the growing rights asserted by the working classes of Polish Catholics. The Richthofen clan was vast and ran along several family lines. The predominant family line was Protestant and that was Walter’s and Manfred’s family line. However, another family line was Catholic and one line was even part Jewish. There is no evidence whatsoever that Walter or his family was overtly anti-semitic and one should be careful about characterizing particular people or even families by nationality or status during particular eras. To give you some idea as to how vast the extended Richthofen family was, I believe that there were 119 Barons von Richthofen killed in World War I, including Manfred, the Red Baron. A few myths also need busting. Walter was NEITHER THE UNCLE NOR GODFATHER of Manfred. Manfred’s family was an entirely different line of Richthofens. This was a myth created by the self-promoting Baroness in a 1927 Rocky Mountain News article where she made this story up and prattled on about her times with dear little “Max”. Manfred’s family history is well documented. It is likely that Walter’s family knew Manfred’s family as they obviously shared a common name and both lived near or in Breslau (today’s Wroclaw, Poland), Walter’s father was a director of the Breslau Hospital for deaf and blind, and Manfred’s father was deafened while earlier serving in the military. But, otherwise connecting the two families other than as distant cousins is impossible. The best known von Richthofen in the 19th Century was another distant cousin, Ferdinand, who was a famed geographer and geologist ( he coined the phrase “Silk Road ” in Southern Asia) and for whom Mount Richthofen in Rocky Mountain National Park is named. A woman of another line of Richthofens married T.E. Lawrence and another later relative commanded the Nazi Luftwaffe’s attempt to supply Stalingrad in World War II. Many Richthofens later fled Silesia during the Russian surge through Silesia and into Germany and one of his descendant’s family members committed suicide rather than face the Russians. After the War, Poland’s borders were oved west making Silesia part of Poland with a mass exodus of Germans from the area. The Prussian manors, castles and estates in Silesia were awfully neglected during the Soviet era and only a few have now been restored while Poland now recognizes Silesia as a potentially booming tourist attraction. But the name “Richthofen” or any recognition of the Prussian period of dominance over this part of today’s Poland is not well-received due to the lingering (and justified) hatred of anything German following World War II. The Richthofen Castle was NOT designed after his family’s castle in Germany- or Prussia- or Silesia. Walter’s immediate family had no castle. They had a very small manor house in Carlowitz (Karlowici) and apartments in Breslau. The Richthofens were lower peerage in Prussian aristocracy but a few had acquired castles since being knighted by Frederick the Great in 1742. Unlike the other Richthofen clans, Walter’s family left agriculture and focused on mining. In the mid -1880’s, they made a giant step by purchasing the Cleophas coal mine in Carlowitz, which would become one of the leading coal mines in Prussia. With the father’s passing in 1893, the mine ownership passed to one of Walter’s brothers. The doctrine of primogeniture, which still dominated the period, made all land holdings pass to the eldest son and that is perhaps why Walter wandered off to America to seek his fame and fortune. However, the family did take care of Walter’s first wife and two children after his divorce and I have an amusing and perhaps uncomfortable photo of Walter’s family just before his father’s death in 1893 showing Walter, his second wife, Louisa, and his two young daughters from his first marriage with their mother, likely living nearby, is notably absent from the family portrait. One possible inspiration for the Baron’s Denver Castle is the Crown Prince’s Castle called Karpniki in Breslau. If you google it, you will see some similarities and one old print shows a remarkable likeness to the Richthofen Castle in Denver. the National Socialist. Prussian nobility were not in the same social as an Austrian painter/politician. I remember going to the castle as a youngster to see my friends that lived there and then on Halloween. Always was amazed by the vastness and incredible beauty. We lived in the Montclair area and there are more areas that the Baron left his touch on. This is a beautiful home. I am getting married in September 2018. I so wish that this historic landmark was available to rent. As I understand it though, Richthofen is a private residence. Where can I find more info on the Halloween event? The Halloween event at Richthofen is a neighborhood event for Montclair. The owners will post information in the local neighborhood closer to Halloween, so look around Montclair for more information. As a Montclair resident, I found this article to be fascinating and I commend the Jespersons’ commitment to the architectural preservation of the castle and to its significance as an historical icon within the community. Thank you to the Jespersons, for respecting Montclair by restoring the castle, reclaiming the adjoining property, and sprucing up its expansive, long-neglected grounds. Richthofen was an antisemite, and a racist. Don’t sugar coat history. James, after consulting with two historians – Tom Noel and Othniel J. Seiden, the latter of whom is a Jewish historian who actually lived in the castle – I found no evidence of any antisemitism or racism on the part of Baron Walter von Richthofen. As I understand it, the KKK was active in Denver, in the 1920’s, and the Baron who built the castle died in 1898. I have found no historical records or rumors beside this of any antisemitism or racism connected to him. If you have evidence to share, that would be helpful, but my research into this subject yielded nothing of that sort. I am curious what the source of your assertion is. While the “Red Baron” was a figure in the German forces of WWI, that war precedes the antisemitism seen in WWII Germany. If there anything other than being the Uncle and Godfather of the famed Red Baron that leads you to associate this man with antisemitism and racism? Your conclusion may be correct. I applaud you response. However, you need to be careful as you are also possibly suggesting that significant anti-semitism did not exist in Germany prior to Nazism. That is inaccurate as much of the anti-Semitic roots of Nazism have been documented in Germany for at least 100 years prior.